ASRRO is a combination of aquifer storage and recovery and reverse osmosis. 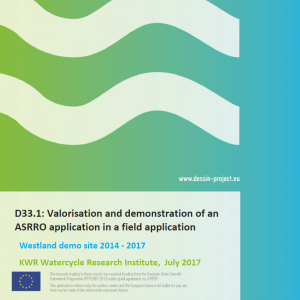 The results at the demonstration site Westland (2013-2017) indicate that ASRRO is technically viable and beneficial. The biggest operational threat during ASRRO in a sand aquifer is clogging of RO-membranes and potentially also of the saline water re-injection well(s). This is caused by mobilization of clay particles (during freshening) and formation of Fe-colloids (by infiltration of oxic water in an area with adsorbed Fe around the ASRRO wells), both in the infiltration stage. Abstraction of brackish water in deeper sections of the aquifer and regular flushing of the RO-membranes are viable methods to overcome these operational threats. The impact of widespread use of ASRRO on the regional Westland groundwater system was limited based on regional groundwater modelling. It was shown that ASRRO decreased the chloride concentration with respect to the autonomous scenario and with respect to the current use of brackish water reverse osmosis (BWRO). ASRRO was successful in mitigating the local negative impact (saltwater plume formation) caused by the deep disposal of membrane concentrate during BWRO and significantly reduced the potential saltwater intrusion that was found in the BWRO case. Albeit more expensive, the use of ASRRO is considered competitive with the current BWRO.